One Armed Maverick: Chorley A&E closure - Poor management? or a hidden agenda? Chorley A&E closure - Poor management? or a hidden agenda? Campaigners hopes of the A&E at Chorley reopening were dashed this week with the Lancashire Teaching Hospitals NHS foundation Trust stating they STILL didn't have enough doctors to reopen the emergency department. Many believe the closure of the A&E at Chorley and South Ribble Hospital was 'engineered' and the ultimate goal is for the Trust to replace the A&E with a 24-hour Urgent Care Centre early next year. The Care Quality Commission (CQC) have rated the Lancashire Teaching Hospitals NHS foundation Trust as 'requiring improvement' across both its hospital sites (Preston and Chorley). As such, the Trust have had penalties placed on them and have fixed targets to meet. The trust are also being closely monitored by both the CQC and Monitor (the body who oversees Hospital foundation trusts). Because of this close scrutiny, be very aware that this hospital trust will not take any risks in case they lose their 'foundation' trust status, oh and they won't want to open the A&E at Chorley until they have a full complement of doctors, even though last week they were only one doctor short and they could have re-opened using a locum whilst continuing with their recruitment campaign, or so it is said. The quickest way to smooth out their finances and remove themselves from the grips of the CQC and Monitor is for the Hospital trust to replace the A&E at Chorley with a less expensive, less surgically intensive, lower risk 'urgent care centre'. A hospital A&E or 'Emergency Department' is the most expensive service a Trust provides. It costs millions per year to run and is very high risk for both patients and hospital trust. Many hospitals have replaced their A&E departments with much the less-expensive urgent care centres. This enables the Trust to settle their finances, pay off any outstanding debts, and improve the ratings and penalties imposed upon the trust by the CQC and MONITOR. The SRG includes health and social care organisations in central Lancashire and is responsible for ensuring the urgent care service is working. The SRG group has been meeting weekly to review the situation at Chorley & Sth Ribble hospital to ensure patient safety is not compromised. This means the staff recruitment process for the Chorley A&E department should have started in 2013. The trust spent almost £1 million to build a new urgent care centre at the side of the A&E at Chorley & South Ribble hospital. At the same time, it was paying consultants £375,000 per year in overtime to cover the A&E rota gaps to prop up the flagging A&E. Before the Trust can reopen the A&E at Chorley, it needs to make a recommendation in relation to what it considers to be a safe, sustainable service level which the SRG, in turn, would need to consider and indicate its support. 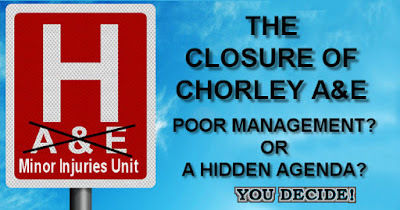 The A&E at Chorley can't reopen without agreement from the SRG. Several times at the SRG meetings it was mentioned that unlike most other trusts, Lancashire teaching hospitals NHS foundation Trust still have 'two' A&E's; a rare and exceptionally financially challeging position when compared to other organisations. This is the first indication of replacing the A&E at Chorley with an urgent care centre. In 2014 The Care Quality Commission gave an overall inspection report rating for the trust as ‘requiring improvement’ for failing to provide safe and responsive services. Ironically, Karen Partington, Chief Executive of Lancashire Teaching Hospitals NHS Foundation Trust said, “Overall the CQC inspection reports are very positive about the way our hospitals are run, and the quality of care we provide". At a Trust Management team meeting in July the trust board stated " there has been little effect on other A&E services because of the closure of our A&E [Chorley] . The minutes from the meeting however paint a different picture saying "Mr G Curry reported on significant pressures that had been seen during the previous weekend at Royal Preston Hospital’s emergency department with a high number of breaches. It was noted that ambulance turnaround times had been affected with ten ambulances backed up on Saturday". At an SRG meeting in July  medical director of the trust Professor M Pugh asked when it was expected that the 24-hour urgent care centre (UCC) would be opened at Chorley and Mr M Gaunt confirmed that the result of the preferred supplier would be known in August, there would be a 3-month mobilisation period and the intention was to open the Chorley and Preston urgent care centre in January 2017. It was suggested the trust make a bid via the CCG to run the UCC but the 'preferred' supplier would be open to a private venture. This appears to be the first indication that a 24 hour privately run urgent care centre would replace Chorley A&E in January 2017.A strategy seems to be unravelling of stalling recruitment of A&E doctors to justify safety issues and replace the A&E with a 24 hour Urgent Care Centre in January 2017. At the same meeting in July, several 'models' were discussed, one of them being to close the A&E at Chorley and replace it with a 24 hour urgent care centre. A temporary decision made in April was to close the A&E and replace it with a 12 hour urgent care centre, with a view to revisiting the other models later. emergency decision unit; safety concerns within EDU and the surgical assessment unit (SAU); and allegations regarding the death of a patient.